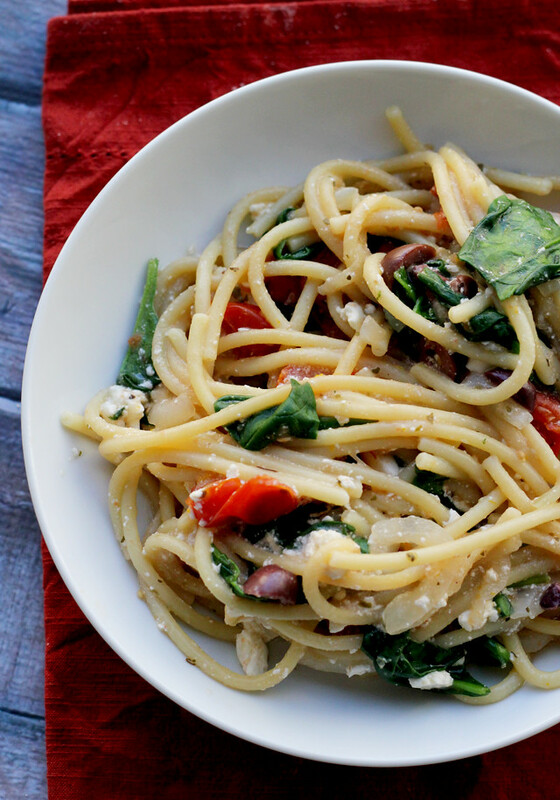 This one-pot spaghetti with Greek tea, feta, and kalamata olives is full of great, fresh Mediterranean flavor and makes for an easy weeknight meal! No, even I’m not immune to the one-pot pasta craze. 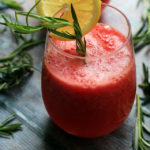 I actually tried out Martha’s recipe this past summer when it first hit the internets in full force, but you might have noticed it didn’t appear anywhere on this blog in any incarnation. Namely because, I was unimpressed. Martha, the self-labeled “recipe development expert“, ex-con (or whatever interns she had create and photograph the recipe) unimpressed me. You could at least pretend to be more surprised. Granted, it had a lot of things going for it. It was easy and one-pot and “just okay”. Not bad, mind you. But “just okay”. And I tend to not deem “just okay” to be blog-worthy. So I thought I would hold out for something better. 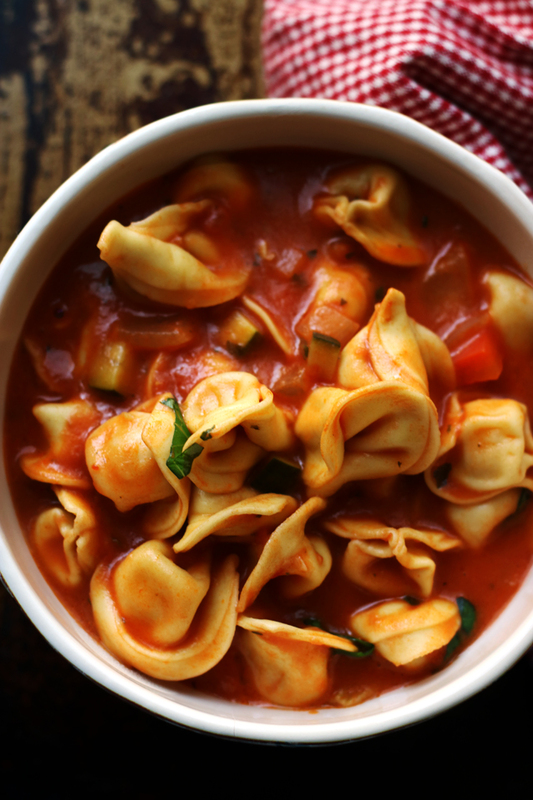 The prince charming of one-pot pastas. The kind you want to take home to your mom on Christmas because WHOA it is THAT GOOD. This is that one-pot pasta. All the best that the Mediterranean has to offer. 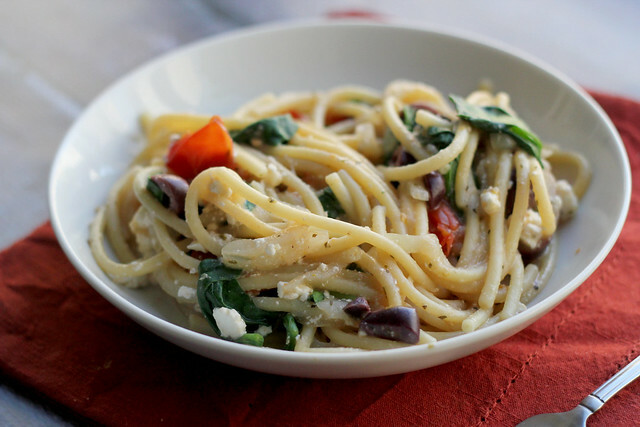 Where Martha’s pasta was really one-note in terms of flavor, this version infuses the pasta with the briny flavors of olives and feta, earthy notes from Greek mountain tea (you can substitute green tea), fruity sweetness from cherry tomatoes, and a pop of green from baby spinach. That’s like twelve-notes of flavor. And counting. It’s everything you thought one-pot pasta could never be, and more. So let’s go ahead and do the one-pot pasta dance, this time with feeling. Break the tea stems into smaller pieces if super long. Put the tea and the bay leaves in a cheesecloth or coffee filter, and tie shut. In a large pot, combine the cheesecloth bundle, spaghetti, onion, cherry tomatoes, water, oregano, lemon peel, garlic powder, and salt. Bring to a boil and cook for 10-12 minutes, or until pasta is tender and liquid has almost entirely evaporated, stirring frequently. While still warm, add the spinach, feta, olives, and lemon juice, and toss to combine. Love all the flavours of this simple and delicious one pot pasta! So many flavors that I love in your version. Can’t wait to try the tea and bay leaves in the cooking water. It doesn’t surprise me that Martha’s dish was just okay… and I’m even less surprised that you found a much more flavorful version to share! Love the idea of such a simple dish that is still delicious. I’m not even going to watch that Martha video, because it sounds like it can only be offensive to me. You know what I AM an expert on? Things I want to eat. I’ll take this over a sad, bland pasta any day. Looks delicious! I love your Martha rant and I love this pasta. Easy to make and flavorful! And one pot? Sign me up! I’d never heard of a one pot pasta before – It sounds like an interesting experiment. Loving it Joanne. I do agree that Martha’s recipe was a little lack lustre but it was the spark for creativity in the kitchen. 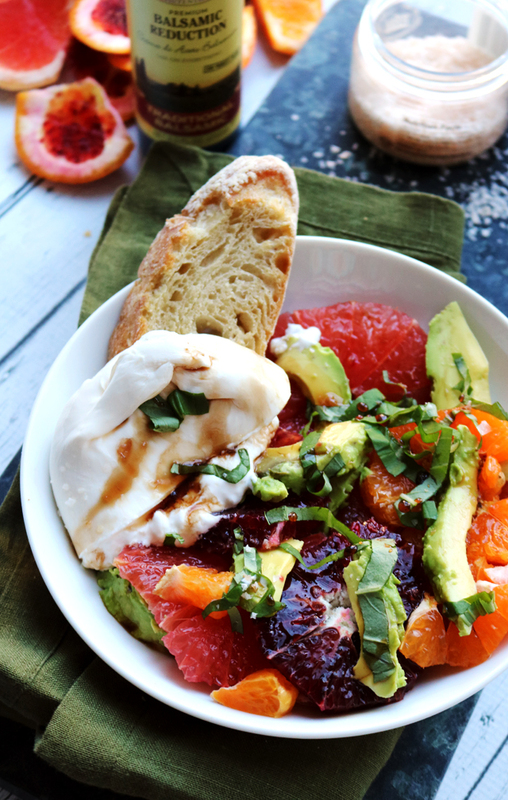 Adding this to my weeknight menu soon! 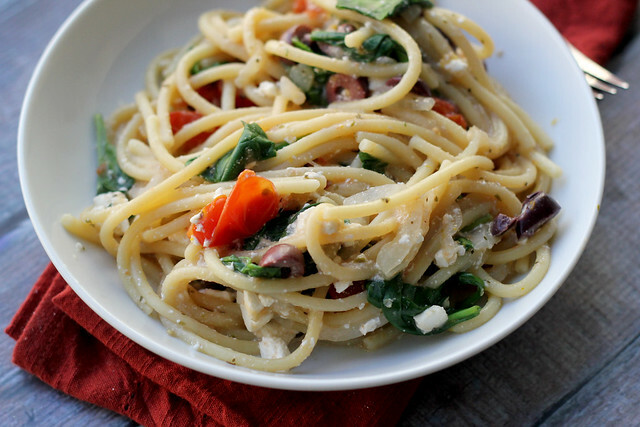 I love one pot pasta dishes, especilaly with the greek flavors! I have up confess that I’m blushing whilst typing this up…I saw Martha’s recipe and that thought it might be a bit gross. I’m curious as to how spaghetti without the draining of starch and minimal stock tastes. This pasta looks way better than “just okay”. I’ll take two bowls! So funny!! Haha I’ve been unimpressed by a few Martha creations too! This one pot pasta though? Definitely looks and sounds impressive! Can’t wait to try it out! 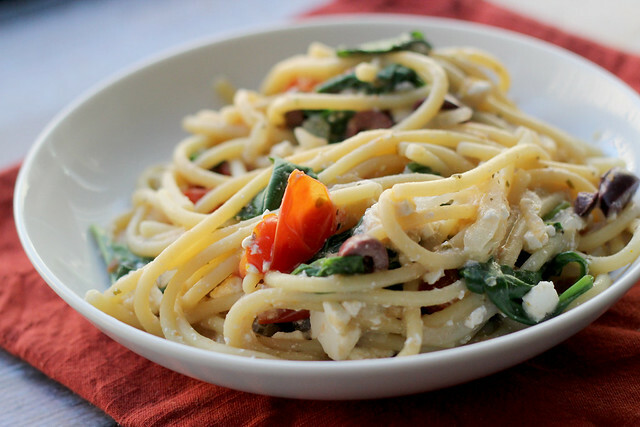 Love your supremely more flavorful one pot pasta – Mediterranean flavors are such a favorite! I am so intrigued by your use of tea in this dish – okay so this might be the stupidest question of the day, but, is the cheesecloth removed before or after the addition of the spinach, feta, olives, and lemon juice? I am not a huge fan of Martha recipes – but your’s are on a whole other level! 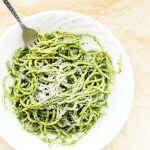 Very interesting the use of green tea – I use it a lot to poach chicken breasts, but never added to pasta. I am intrigued! I have a stack of one-pot pasta dishes that I’ve been hoarding. I think hers might be in there (*note to self – toss that one!) I totally want this. Love Mediterranean flavors! LOVE this recipe. 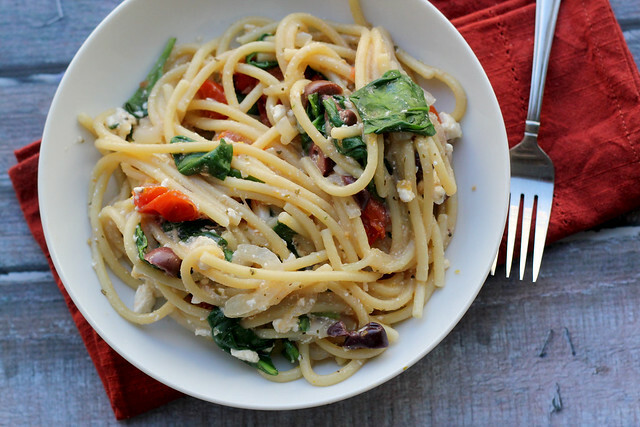 Yummy one-pot pastas have my heart (and my tummy) forever and ever. Insane amount of flavor in here, I will need chocolate afterwards! Tea in pasta sounds so inventive and delicious! I can’t wait to try out that technique. tea in pasta?! how interesting. i’m so intrigued! Have to admit, I’m not surprised about the Martha Steward recipe being just meh. Ever since she pulled her whole “food bloggers aren’t experts, they don’t test their recipes, blah, blah blah” I have been a Martha naysayer. Your pasta looks AMAZING! I’ve been wanting to try a one pot pasta and seeing your mediterranean-style one is getting me all giddy! this looks delicious! i have a hard time with pasta dishes because i have a mild tomato allergy (i know, its horrible), but i think this is one where i could easily sub red peppers and it would still be amazing. can’t wait to try it! 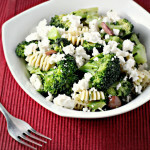 I had pasta before with olives, feta and spinach, but not with tea, sounds very interesting! Hahhah you always crack me up in the mornings. Love one pot pastas but more so than not, I am disappointed. I love the rich flavor profile here and can’t wait to try this. all in one pot?! that does seem to o good to be true 🙂 looks great! This is WONDERFUL and I love that you put tea in the water- the briney flavor and tea is a WIN for me! Love it! This is a perfect pasta dish! Greek mountain tea? New ingredient to me. And your pasta DOES look like the prince charming of one-pot pastas. p.s. 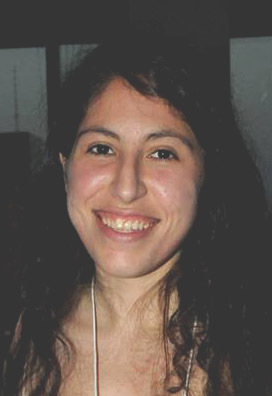 I agree with you about M.S….especially about the interns creating and photographing her stuff. One pot pasta dishes – I’ve been thinking about this, but haven’t tried one yet. Maybe this time I will. Looks good. I’m totally intrigued by the Greek tea aspect. What? Are you messing with Martha, Joanne?! ; ) haha…seriously, your version sounds great. I bet the flavors are bursting out here. 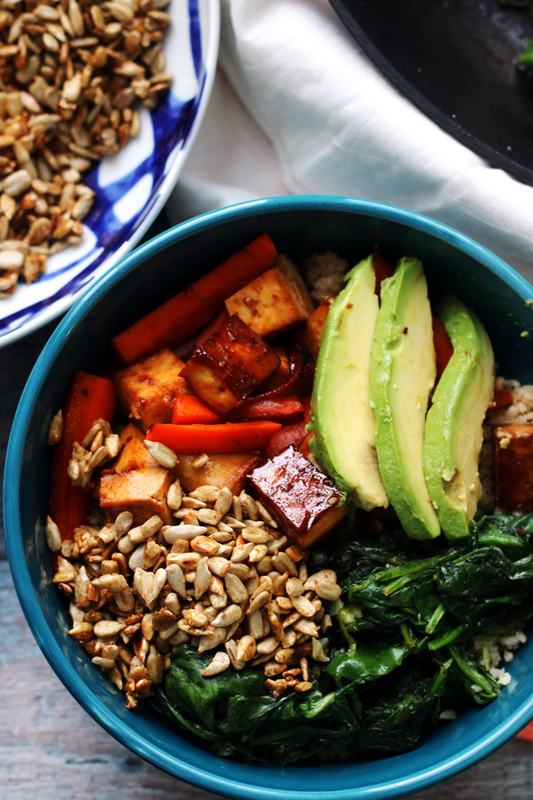 Have you ever tried Smitten Kitchen’s version with farro? I haven’t tried this one-pot technique but you’ve got me curious again now (which is very good). I’ve actually heard the same thing from several other bloggers, which is why I have yet to give the one pot craze a try, despite it being very tempting (one pot! 30 minutes!). This looks worth the wait! I never thought the whole one-pot craze was that useful. I mean, pasta is already one of the quickest things ever–why bother trying to make it faster? That said, this pasta sounds just fantastic. Olives and feta and lemon! NOM. Anything Martha can do, you can do it better. You need that on a T-shirt. I don’t think I’ve ever cooked with greek tea, how interesting! Thank you for introducing me to something new, Jo! Oh I just love this! Perfect…..It sounds so good with all the different flavors. Another keeper for me! I am also intrigued by the use of tea in this dish! I’ve infused tea with my oatmeal before, and I guess it makes sense to try it with other carbs/grains that require water for cooking for some added flavor. Mmmmnmm feta and olives is such a great match – definitely makes me think of warm summer days! Such an amazing Mediterranean vibe! Well, Joanne, obviously this recipe of yours caught my attention pretty quickly, being in Greece and all! I would never have thought of adding Greek tea (tsai vouno!) into a recipe … such a fabulous idea! Martha obviously aint got nothin on this! Wow – using tea in pasta is a completely new idea to me! It sounds really interesting. I love a good one-pot dish, too! Need to try this one-pot thing! Umm..I’m all for the idea of Martha–but Martha herself? I’ll pass. I’ve had several Martha “recipe-tester tested” recipe that were pretty B-O-R-I-N-G. This version definitely sounds way more flavorful than Martha’s! I recently made a one-pot farro modeled after her recipe and I was really happy with how it came out. well all we can say is ” all right, all right, all right! ” great review about Martha versions too! One pot-dinners are always great for weeknight meals! I’ll skip Martha’s and go straight to this–I prefer Greek flavors anyway! YUM! I feel the same way about that original recipe! I also am sometimes skeptical of her recipes because some that I have tried haven’t worked out. I love this Greek interpretation!!! Lite, quick, full of taste… what else can you ask for. Interesting use of green tea. And, btw, the Ex-con actually has some very interesting recipes at times. I think she farms them out, but still interesting none the less. Yes, I can see where this would have a ton of flavor. Looks yummy! I love the Mediterranean touch in this pasta. Okay, I have yet to try the one pot pasta method. And yeah, mainly because I just wasn’t sure…about many things. But one look at yours, and I’m ready to have pasta for breakfast! There’s no doubt in my mind that the flavors in this are perfection. 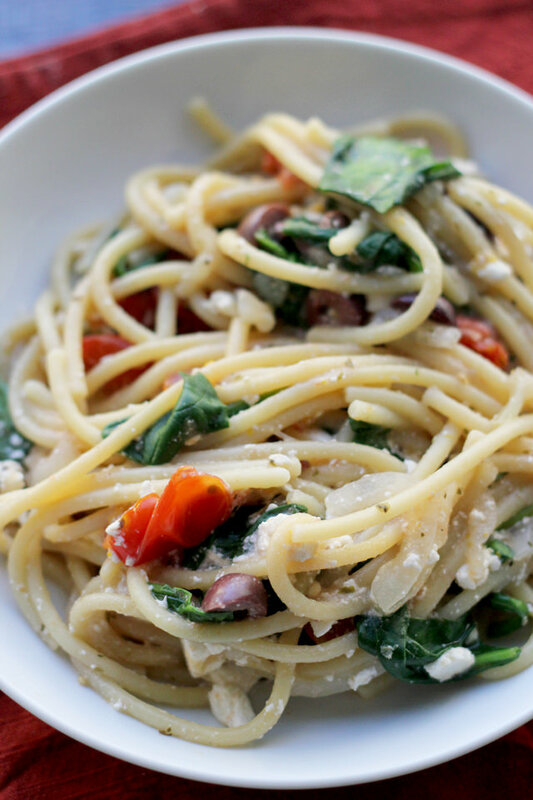 This pasta has all of my favorite Mediterranean flavors packed into one! I love feta and kalamata olives more than anyone should, and don’t even get me started on my dangerous love of all pasta… this pasta could send any carboholic to rehab, haha. Love it! Another blogger I read did a very funny post about the lack of success of that one pot pasta! Personally, I love the flavour of plain boiled pasta – I always look for that flavour under any sauces, so these dishes don’t really appeal to me but I do love your idea of adding tea! 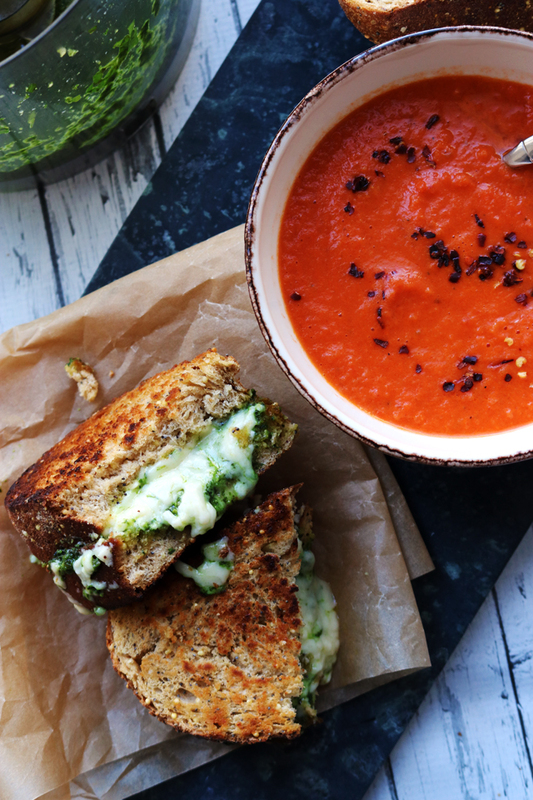 Glad you held out for something better – this sounds delicious! 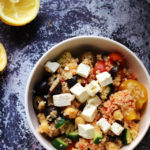 This looks divine- I love Greek flavours and feta cheese is my favourite! To me Martha’s recipes are just bleh – definitely not as creative as most blogger’s recipes… But that might just be my opinion hehe. Your pasta dish, on the other side, looks super flavorful! Love that mediterranean twist! “And I tend to not deem “just okay” to be blog-worthy” Totally on the same page! Martha may have some good recipes but despite popular believe not all of them are winners. I can say that from experience. Obviously I love all these flavors, but the tea ingredient is really interesting! I’ll have to try it out. I’m totally making this tonight!!!! Mmm! !